Current Human Condition And Perceptions - Politics, News, and Hypocrisy - Chickensomething What Are You Afraid Of? Technology and science have contributed much in this endeavor. 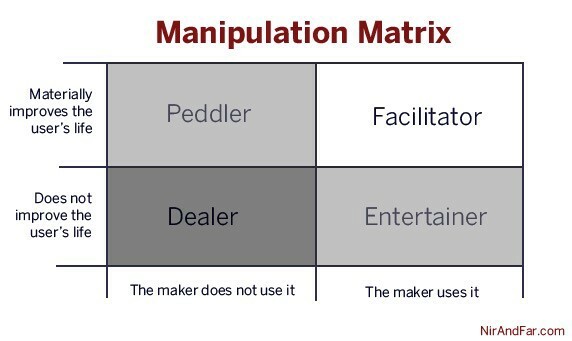 Anyone who plans to use her own products AND believes that these products provide meaningful value OR entertainment to their users should have no qualms about manipulating their users’ pscyhology without disclosing to those users exactly what’s being done to their brains. While I don’t know you personally, Nir, I believe from the reports of professional acquaintances and various things I’ve read that you are a genuinely kind, well-intentioned man who sees yourself offering services in the “facilitator” quadrant. But with all due respect to your reputed kindness and good intentions, the core arguments in your essay and the moral logic of your Manipulation Matrix are complete and utter nonsense. Recurring failures to be mentally present while spending time with family and friends. Yes, those harms are FAR LESS SEVERE to an individual than, say, lung cancer, cirrhosis, meth mouth, or chronic obesity, but they are still harms. And unlike the harms from cigarettes, liquor, junk food, and meth, the harms from addictive technology are have not yet been researched enough to prove. But as the weaponization of Facebook, Instagram, YouTube, and Twitter by enemies of the United States’s democratic system makes clear, optimizing for engagement at internet-scale can have profoundly harmful near-term consequences for civic society. It’s too soon to tell, but it ain’t look so pretty from here. Trusting the creators of any product to make accurate moral judgments when those judgements impact their profits is completely unrealistic (at best). Likewise, expecting the managers, employees, and investors of any business to make clear-headed objective evaluations about the “value” or “entertainment” provided by their creations is so naive that it’s hard for me to accept that you really thought hard about what you are proposing. I notice now how the music got faster and more distorted in its content. Kind of reminds me of the story of Job in the bible. Only 'mankind' is Job metaphorically and the story of Us is being played out in the allegorical sense. Except we haven't reached the end of the story. I wonder what part of the story mankind can place itself within the timeline?